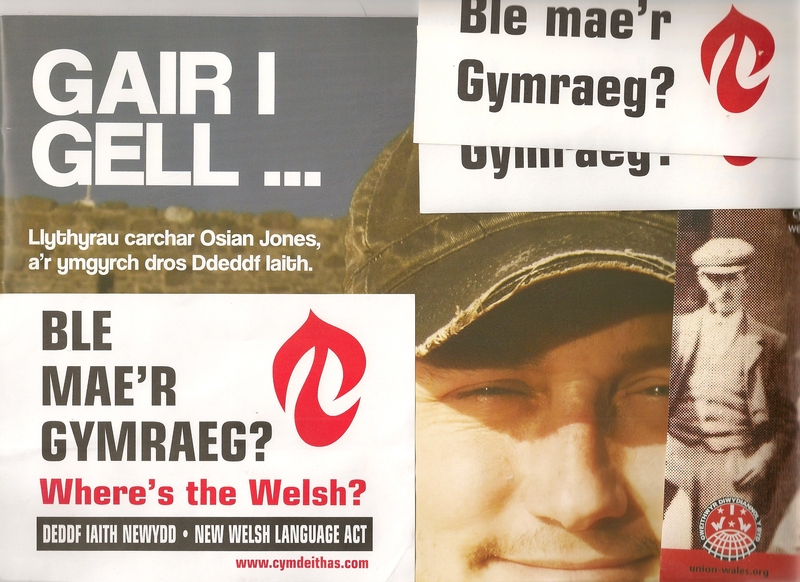 Just a little follow up on the previous post regarding Welsh language activist Osian Jones. The campaign to achieve a New Welsh Language Act and make Wales officially bi-lingual is on-going and remains strong. A friend and fellow activist of Osian sent me a package of materials from Cymdeithas yr Iaith Gymraeg as well as propaganda from the radical union that the two of them are members of – Gweithwyr Diwydiannol y Byd – the Industrial Workers of the World. Amongst the stickers and ‘badges’ was a nice glossy brochure entitled Gair I Gell… Llythyrau carchar Osian Jones, a’r ymgyrch dros Ddeddf Iaith (Word to Cell … Prison Letters of Osian Jones and the Campaign for the Language Act.) There were bits of English in the publication that were satisying but because I don’t speak Cymraeg, I was forced to simply admire its exotic spelling and imagine its other-worldly pronunciation. The Welsh language struggle is a very compelling cause but I can’t help but think of the sobering comments from Arika Okrent in In the Land of Invented Languages where she talks about how difficult it is to start, revive, or maintain a language if it is falling into disuse. She describes how Irish (Gaeilge), Navajo (Diné bizaad), and others have a difficult time maintaining even with official status and institutional sponsorship. The best counter example of this being Modern Hebrew (עִבְרִית) in Israel. Okrent and other linguists I’ve read discuss how people have to want to speak it instead of… well, English. With so many forces, both malicious as well as benign, compelling people to speak and create and live in English, its a gargantuan task to fend it off and attempt to create a new interest in living and creating in Welsh or another national or regional language. But since language is crucial to cultural vitality, the struggle must be waged, no matter how difficult, so that English does not swallow up yet another unique piece of the world’s heritage. Hats off to the Cymdeithas movement! Keep inspiring and keep working to show the world the value of the Welsh language. Mewn Undeb mae nerth!